Man, I haven’t been bowling for a LONG time. One time in college, I stayed for a summer term and took bowling and tennis, and that’s it. Don’t tell my parents. 😀 Just kidding. I think they know. Even after a whole semester of bowling studies, I still can’t get over 100. Oh well. 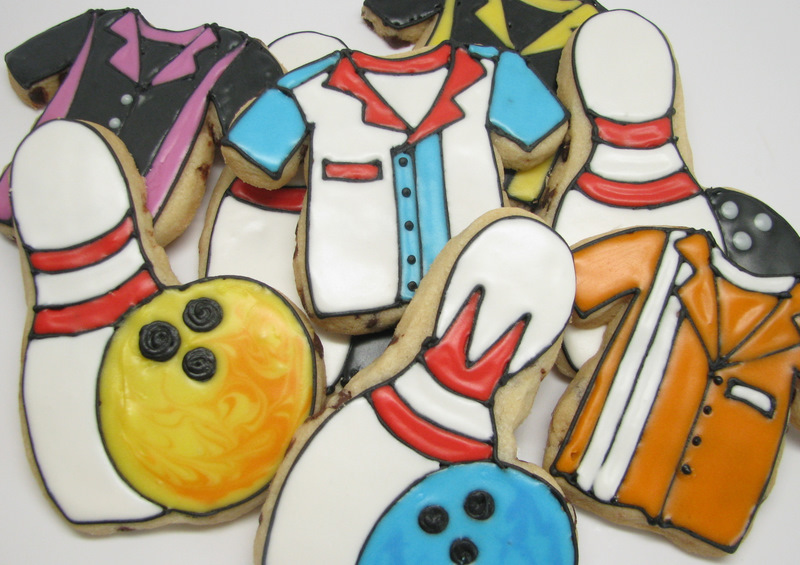 Some people weren’t born to bowl, but if you were, you might like these cookies. You know how a lot of bowling balls have a marbled look to them? I tried that on a couple of these. I filled with one color (yellow and light blue), and then dripped in another color (orange and darker blue), and just swirled around randomly with my boo boo stick. I thought they came out kind of cute. The debate at my house was whether the ball looked better in front of the pin or behind it. My son votes for in front, and I tend to agree. But it’s kind of hard to get a perfect circle, even if you use a template, so if you put it behind, it hides a multitude of sins. 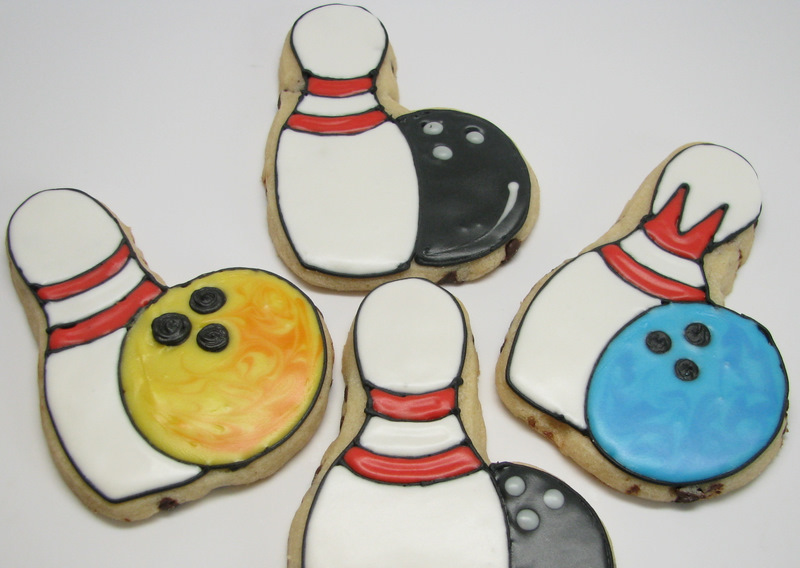 And I think I like the pins where I came in farther from the edge of the cookie at the neck of the pin. If you follow the edge of this cutter exactly, it makes for fatter, less defined pins. Don’t be afraid to ignore the “lines” of your cutters. You can’t go bowling without a spiffy bowling shirt! These were fun to design. 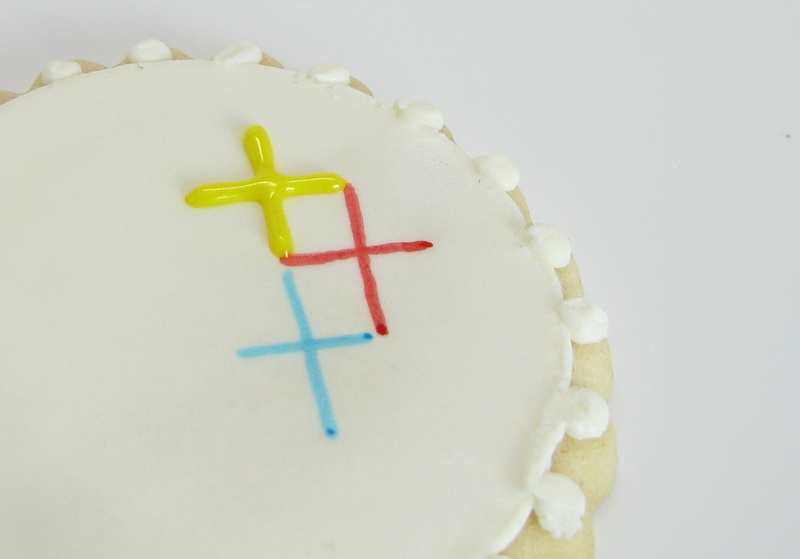 You probably already know this, but here’s my secret for designing cookies. 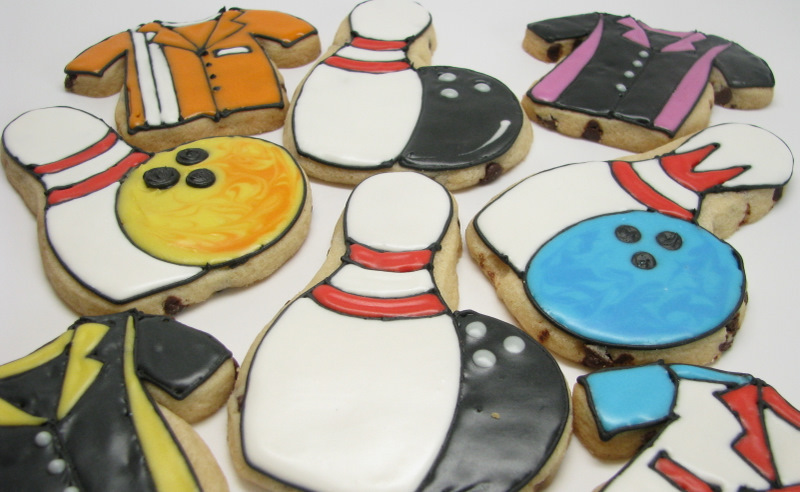 I do a Google image search for whatever it is I’m trying to figure out (so for these, I just typed in “bowling shirt”), and then click on images. Then from there, I usually choose the “clip art” option on the left-hand side. 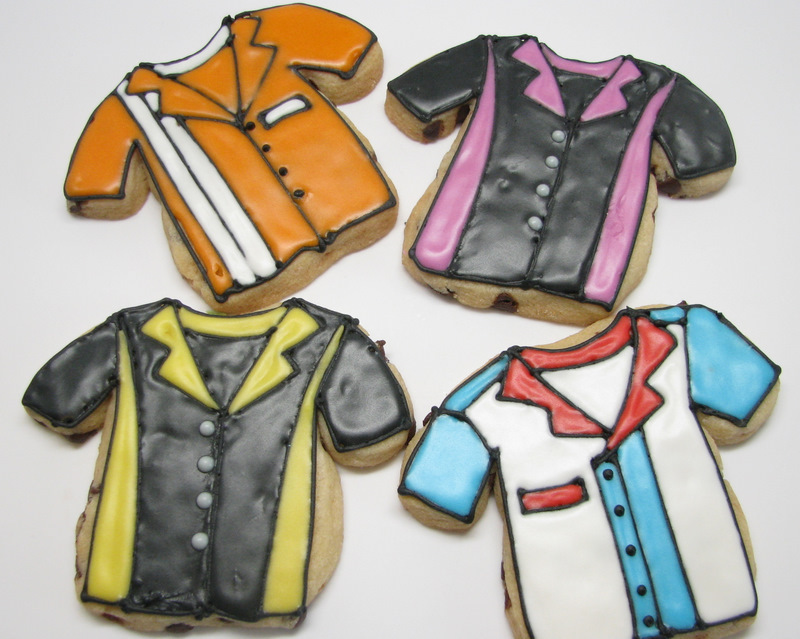 You’ll get all kinds of fun ideas that translate well to cookies. So comment on this post by midnight Friday, Feb. 18 to be entered to win! This weekend, I’ll use Random.org to choose 5 winners to win one of each cutter. So I hear there’s some big football game on Sunday. Let me just disclose something right off the bat: I know nothing about football. 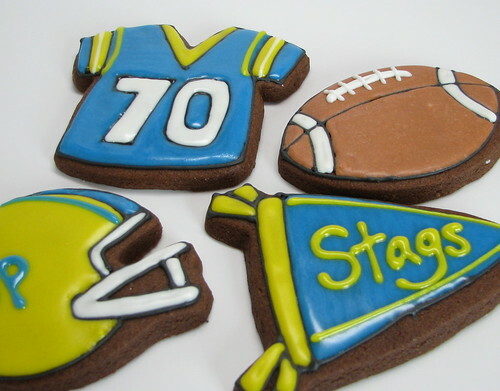 The only team I’ve ever rooted for was my high school football team when my brother Dan was #70 and nicknamed Danimal. Annnnnd…. that was about 18 years ago, give or take. No, the only thing I really pay attention to when it comes to the Superbowl are the commercials, which I watch on YouTube on Monday morning so I don’t have to wade through all that football to see them. Oh, and I get really jealous thinking about all the guacamole that’s being consumed around the country. Sometimes I think I should have a Superbowl Party just so I can make some Seven Layer Dip and Little Smokies. But Mike isn’t into football either (if you ask him who’s playing in the Superbowl, he’ll probably say “Um… the Angels?” Try it sometime.) We’re not Superbowl people, just so we’re clear. But how about you? Are you having a party? Are you making cookies? Are you rooting for this team? Or how about the 1993 Deer Park High School Football team? 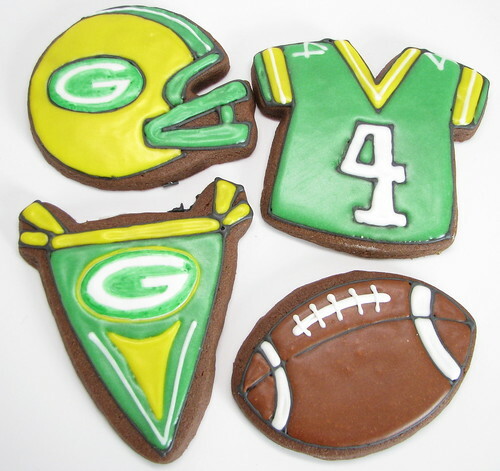 Now, I know I’m very late to have a football cookie cutter giveaway. 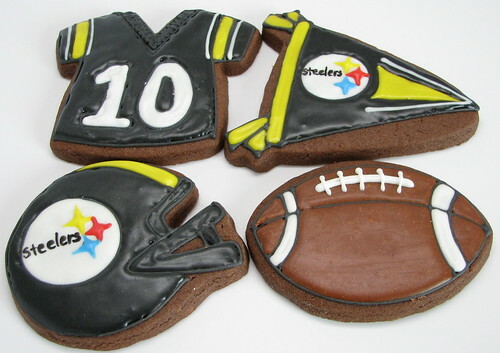 There’s no way I’m going to get these to the winner by Superbowl Sunday, even if I sent them yesterday. But there’s always next year. And there’s always the fall when you or someone you love starts following (or playing for) their favorite football team. It’s never too early to plan ahead, right? The Question is: What is your level of interest in the Superbowl? 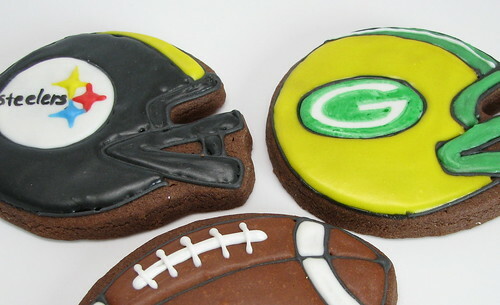 Are you there for the food, the football, or the commercials? Are you having a party? Or are you asking yourself right now “What in the world is the Superbowl? ?” I’m just taking a poll. Ok, now a quickly-thrown-together-not-very-thorough tutorial on the Steelers logo, for those who are interested. It actually was a lot simpler than I had thought originally, so I thought I’d share what I did. 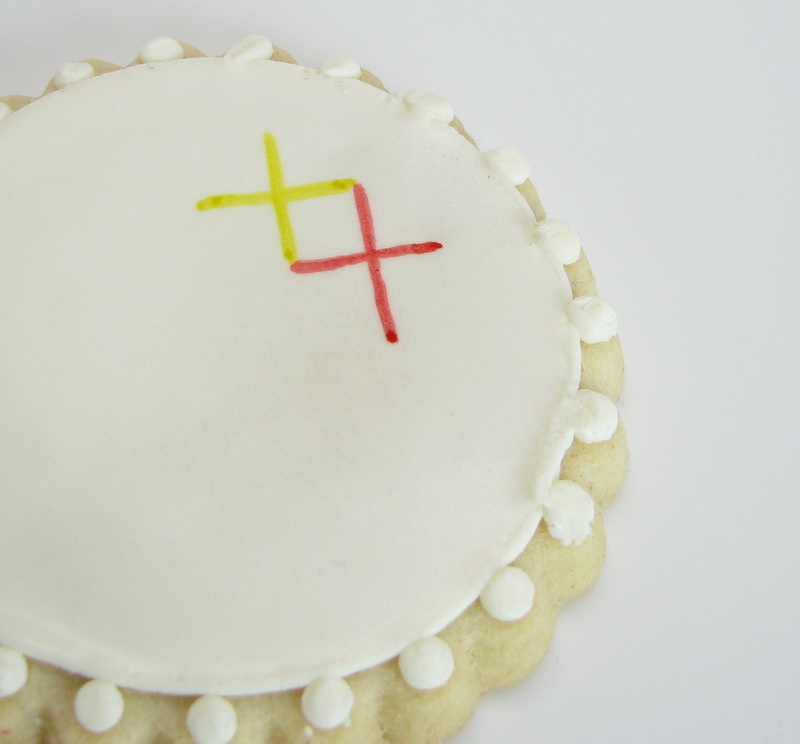 This was totally an afterthought, so I had to use a cookie that was intended for something else– so no laughing. I drew all these lines with food coloring markers, but if you don’t have any of those, you can also scratch the lines in with a scraper or toothpick. Or you can even use a graphite pencil, which is non-toxic and will give you some good guidelines. 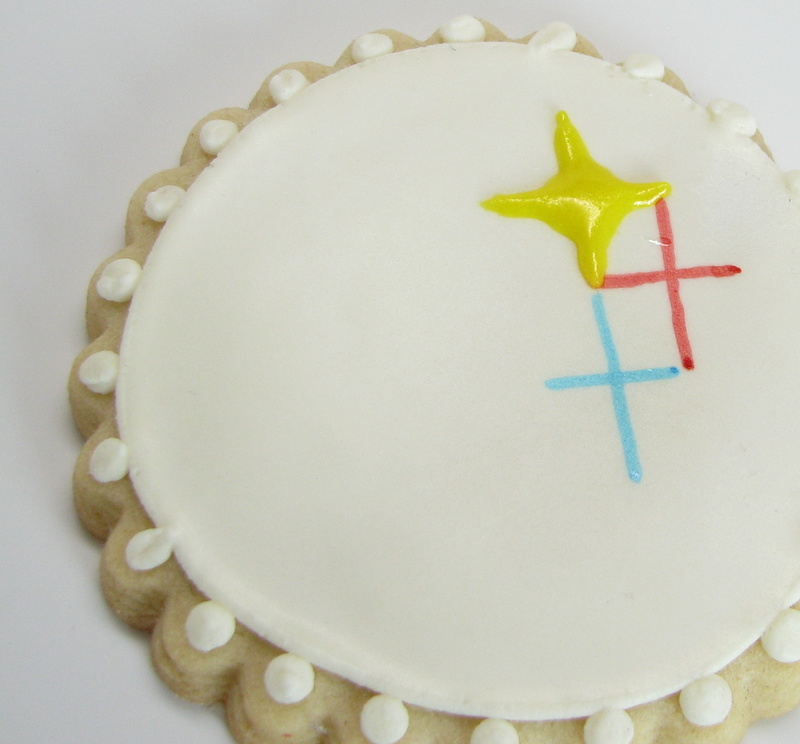 I liked using the marker so that the color matched the frosting color, in case some showed through. 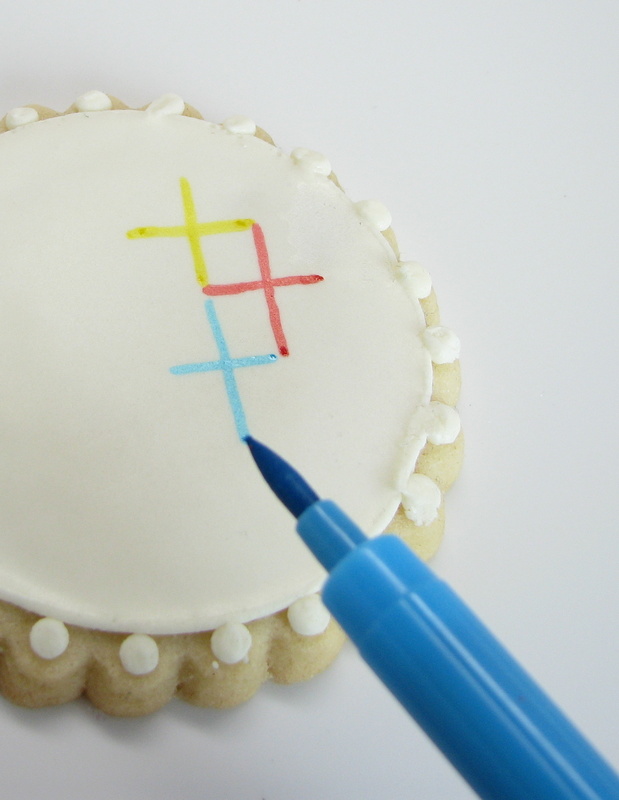 Then you’ll go back and pipe over these lines with coordinating colors, using a pretty runny-consistency frosting. 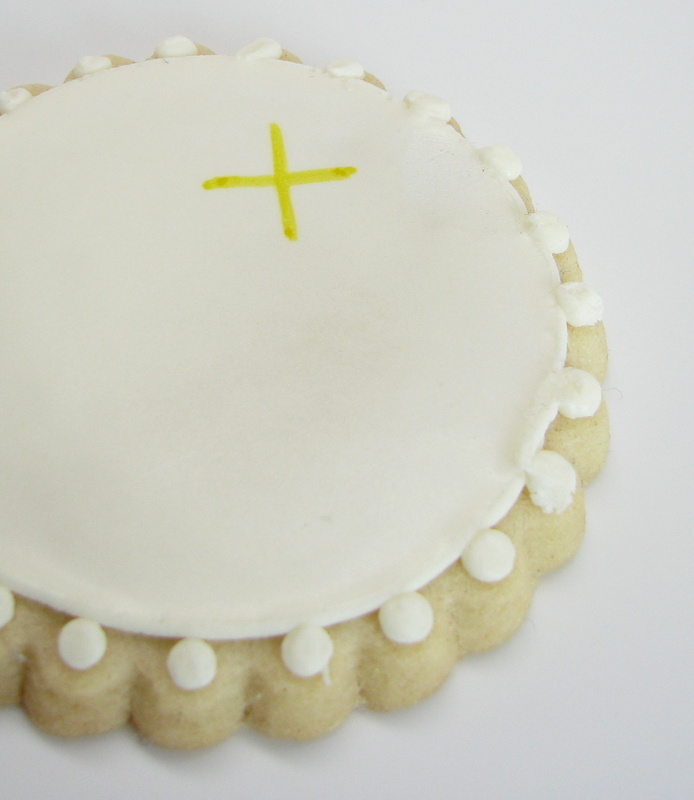 After you get the cross piped on, go back and add four dots in each inside “corner” of the cross. I really wanted a picture of this next part, but I CAN NOT figure out how to take pictures of my own hands working on something. Hey all you food bloggers out there— how do you do that?? A tripod? Timers? I can’t seem to get it figured out. But what I did was take my boo-boo stick (a toothpick would also work), and just pushed the frosting around until it formed the shape I wanted. 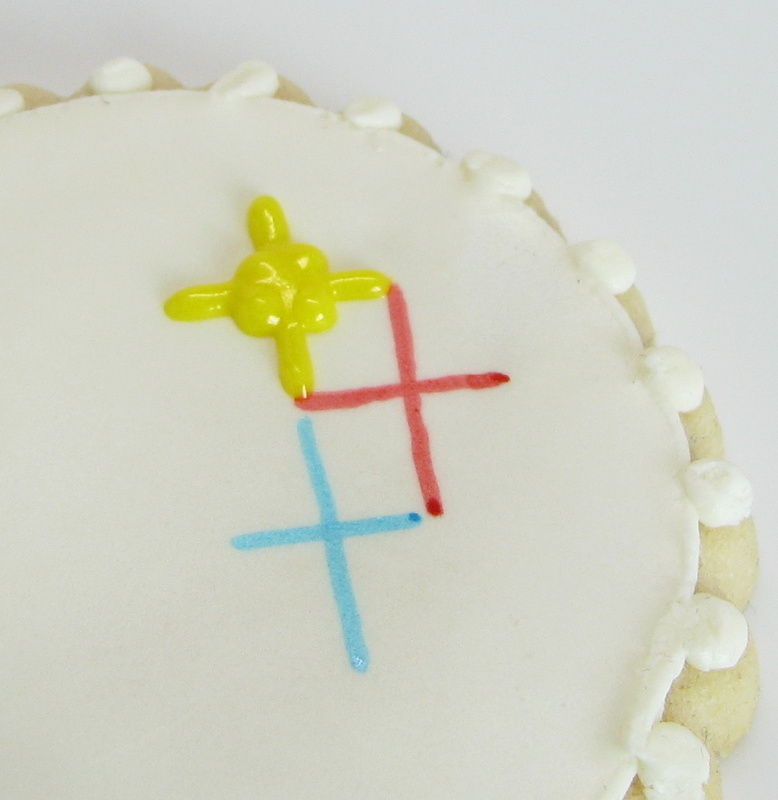 With the cross and the dots, you’re really already almost there– just use a scraper of some sort to smooth out the lines and make it look like you want it to. 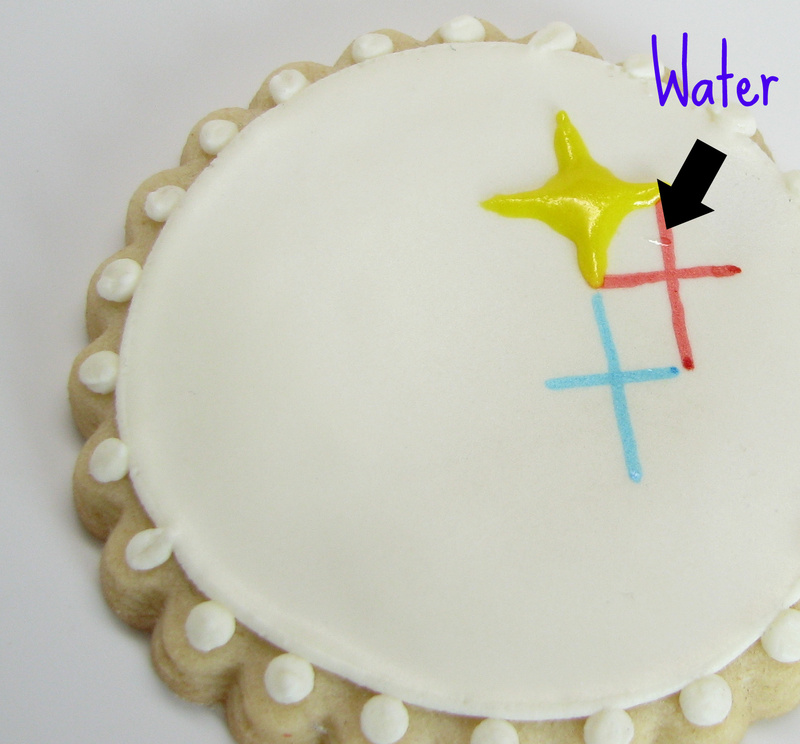 And please make sure you wash off your boo-boo stick before you drag it through the yellow frosting. 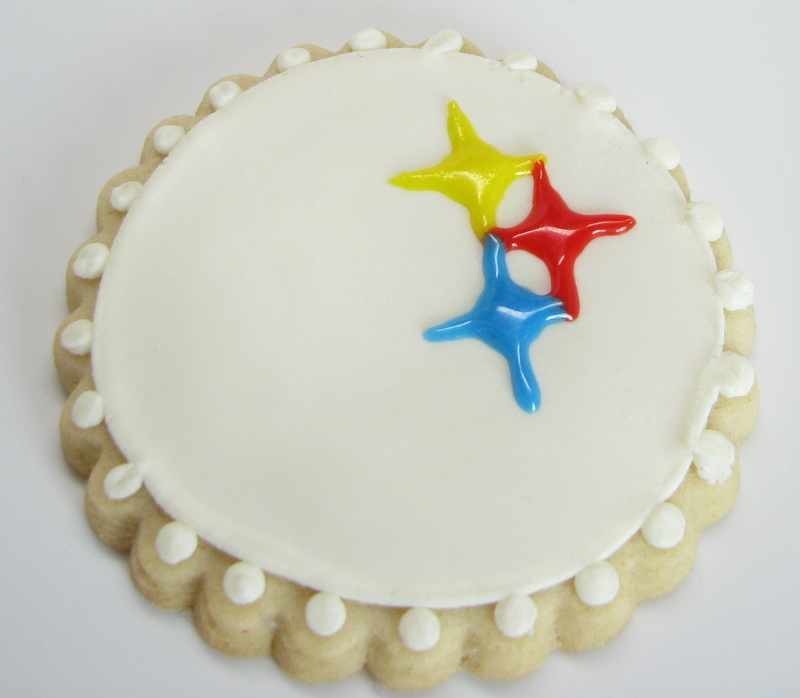 And after you wash it, make sure you dry it really well so you don’t get water droplets on your cookie. Continue on with the other colors. 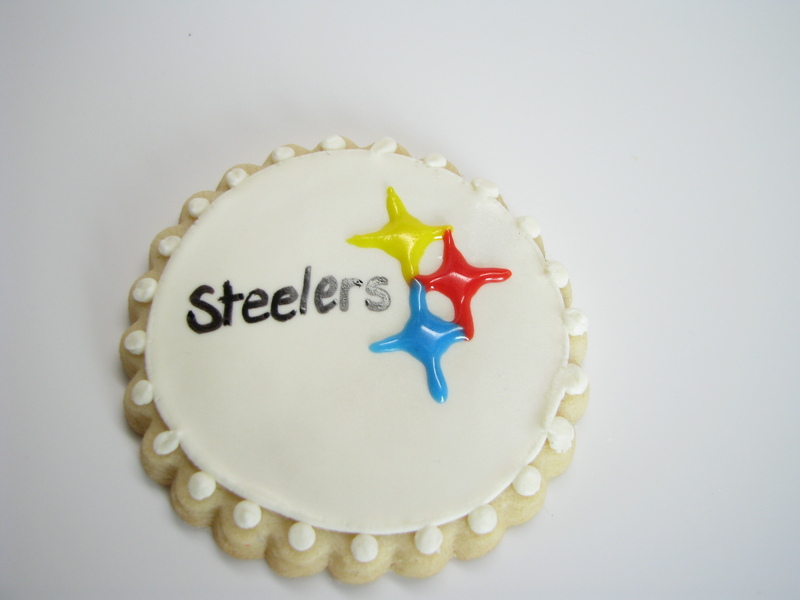 Then add the Steelers, either piped or with food coloring marker, whichever you’re more comfortable with. I used marker and wished I would have piped it. I have much better piping penmanship than I do marker penmanship, which is the exact opposite of most people. OOPS! Forgot to add– Giveaway ends Sunday, Feb 6th at Midnight. Please only enter one time. Good luck! !